When you think of organizational culture, what comes to mind? Most people respond to this question by stating that culture is “the vibe around the office” or “how people treat each other”. Some talk about pizza parties and vacation policy, and still others try to be specific by citing trust or leadership as their culture. The challenge with those definitions is that they tend to be viewed on a good-to-bad scale. For example, trust can be low or high. People can treat each other well or poorly. In fact, I regularly hear people describe their company’s culture as “good” or “bad”. Culture is the personality of the organization, and like personality, culture really exists on a good-to-good scale. Think about extraversion (a personality characteristic): there’s no bad place to fall along the spectrum of extraversion. What works and doesn’t depends on what you’re trying to accomplish. Now let’s reflect on a dimension of organizational culture, such as Atmosphere. Is your organization’s atmosphere highly disciplined and formal (e.g. military) or is it more social and informal (e.g. Google)? Both are very successful, demonstrating that culture exists on a good-to-good continuum. What culture is needed at your organization depends almost exclusively on what you’re trying to accomplish. How is culture a competitive advantage? If strategy is what your company is trying to accomplish, then culture is how you accomplish it. Studies have shown that organizations with a purposefully aligned culture demonstrate significant advantages over their competitors in revenue generation, job growth, stock price and net income. Purposeful culture can also account for as much as 50% of the competitive difference between organizations over a 10-year period (Heskett, The Culture Cycle, 2011). Culture becomes a competitive advantage when all employees in your organization approach how they do their work in a purposeful way. For example, let’s imagine your organization wants to increase customer retention by 15%. 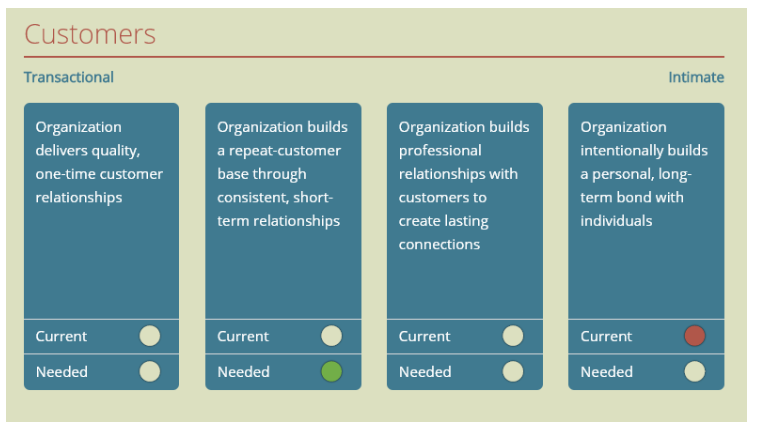 Using the Customers dimension of culture, should your organization pursue transactional, short-term relationships with customers? Or should it develop intimate, long-term relationships? Once the organization knows what culture is needed to accomplish its goals, it can assess its current culture and hire/train/manage employees to be more purposefully aligned. Cultural change is difficult. Most organizations that try to be purposeful about their culture fail, primarily because they don’t have a clear framework of culture to work with. Companies usually start with the obvious stuff, such as organizational structure or tools, which are relatively easy to change but don’t yield long-term competitive advantages. Some will go deeper, focusing on reward systems and performance measures, and a few will even pursue true behavioral change (espoused values, higher engagement, etc.). These initiatives are great, but they don’t result in a purposeful culture. Changing your organization’s culture is more challenging because it means disrupting beliefs and social norms. A purposefully aligned culture should really challenge employees to think about how they do their job and not just what they need to accomplish. An organization that is truly committed to this can change its culture in about 7-10 years and expect a competitive advantage that lasts about the same amount of time. However, using a framework that expresses culture along a good-to-good continuum can greatly reduce the change cycle to less than 2 years, while still conferring that 7-10 year competitive advantage. How can I leverage culture? Work Effects has a research-driven framework for organizational culture that is practical and easy to understand. The model divides culture into 10 critical dimensions (Atmosphere, Customers, etc.) that exist along a good-to-good continuum. A good first step for any organization interested in purposeful culture would be to determine their current state of culture and then define what culture is needed to accomplish their strategic goals. The Culture Check is a quick tool for checking on your organization’s culture and determining how far you are from being purposefully aligned. PreviousPrevious post:Phase IV : Deploy Action PlansNextNext post:Don’t Build Your Company Culture – Manage It!